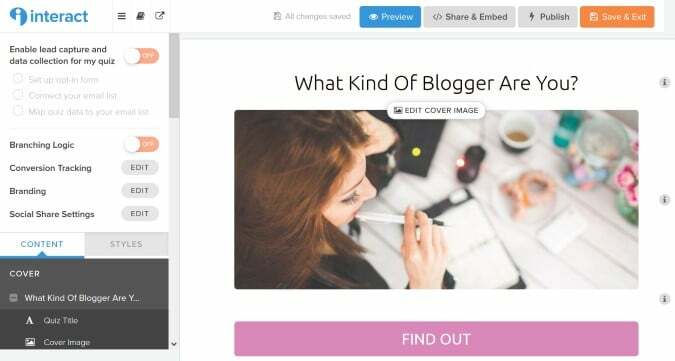 Whether you’re talking email marketing or content marketing in general, using interactive content is one of the best ways to raise awareness of your business and generate leads. If you think about it, haven’t we all done those quizzes on Facebook that ask “what kind of [fill in the blank] are you”? I know I have, and I’m pretty skeptical about Facebookery. I’ve wanted to use quizzes for a while, and have even tried my hand at creating some in the past. But in many cases it was time-consuming and complicated, and that’s BEFORE thinking about the lead generation aspect. That’s why I was so interested in Interact, because they promised that it was ridiculously easy to use. I have to admit that given my past experience, I was skeptical. But Interact lived up to its promise. 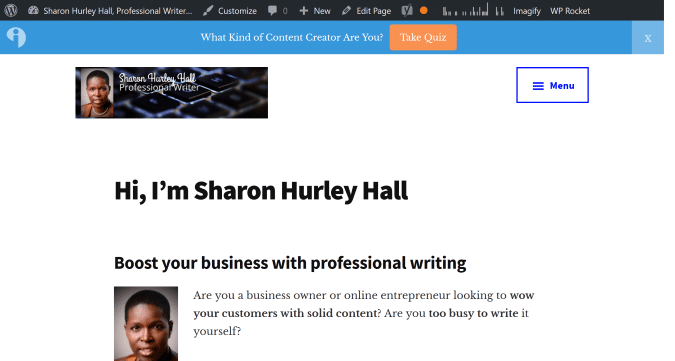 I had a fully functional quiz (What Kind of Content Creator Are You?) around 30 minutes after logging into my account. You can check it out at the top of the page – and feel free to try the quiz yourself. 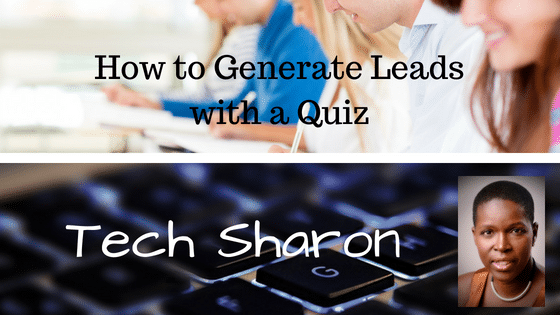 So, just how easy was it to create the lead generation quiz? Let me walk you through the process I followed. When you login, your starting point is the Create New Quiz button. 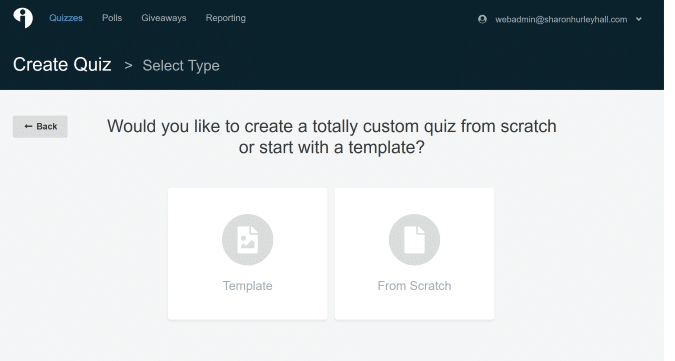 That takes you to another screen where you can choose to use an existing quiz template or create from scratch. I chose a template, because it seemed the easiest way to get started. Next, choose your industry. (there were 22 to choose from at the time of writing). Once your selection is highlighted, choose your quiz type. 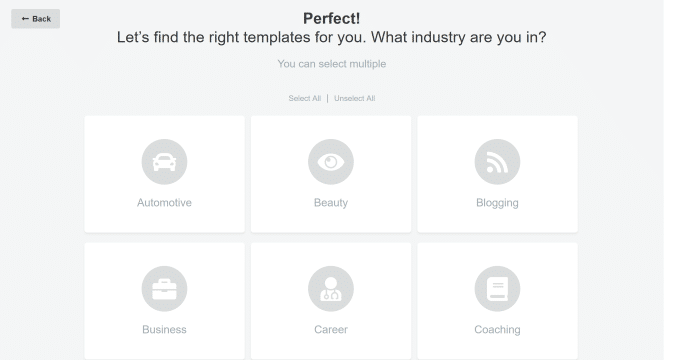 I chose Blogging as my industry, then had the option of three types of quizzes: Assessment, Personality, or Scored. I went for Personality, as these types of quizzes often appeal on social media (even a skeptic like me will do them). 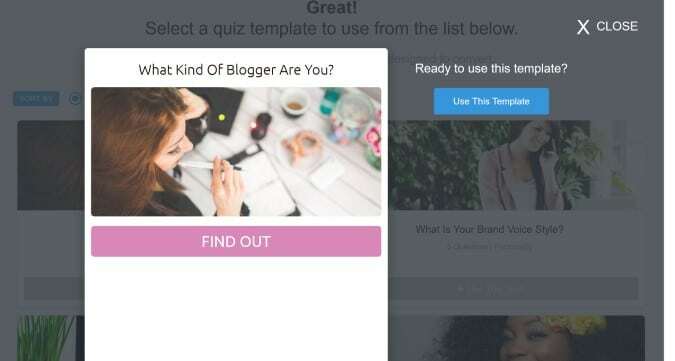 Next, you’ll be able to choose from a range of lead generation quiz templates. Hover over each to see the preview button, then click it to see what the quiz will look like. Once you’ve decided on a template, click Use This Template. That’ll take you to the quiz customization section. There, you can customize virtually every aspect of your quiz, from the cover image to the questions and more. Click on an area in the preview screen to bring up the corresponding menu item in the left sidebar, then edit as you wish. Questions and results are set up in advance, making it super easy to have a working quiz fast. I only made minor edits as I wanted to test how quick the process was. However, if I’d wanted to, I could have edited every question and answer. 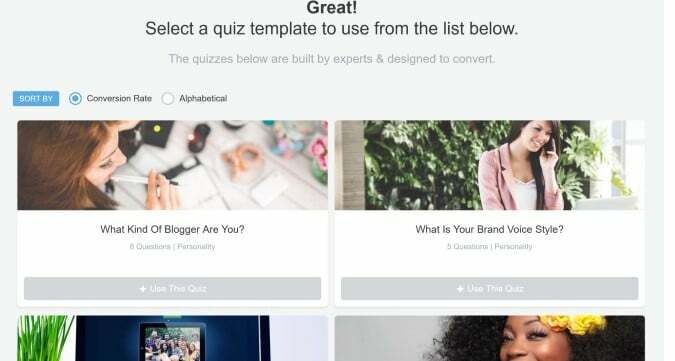 If you’re using your quiz for lead generation, one of the most important sections to set up is the lead capture area. Toggle the button at the top of the menu area to enable this. Since Interact integrates with all the top providers, you won’t have any difficulty setting yours up. 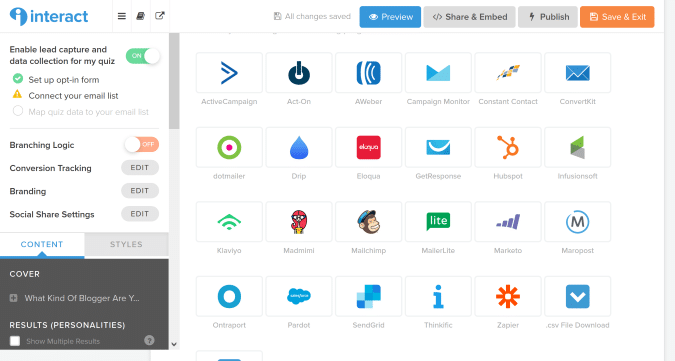 Just click the button (I chose MailChimp) and it will walk you through the email list connection. 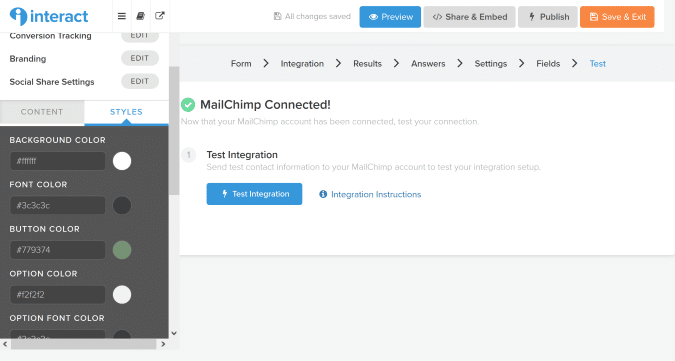 To complete the integration, choose what happens when people submit their email addresses for the results. 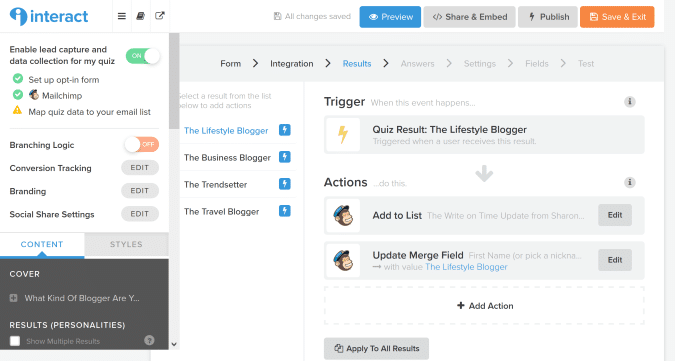 Select your list and choose the relevant merge fields. 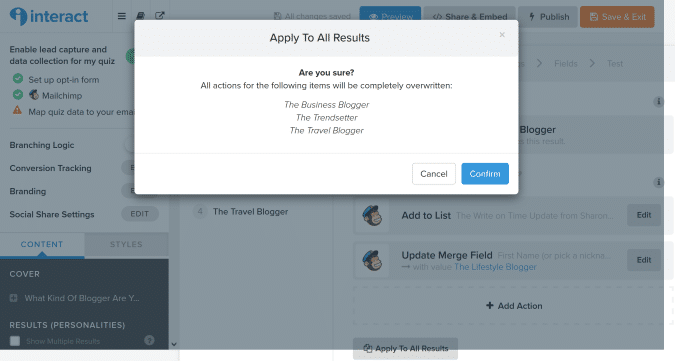 Once you’ve selected the desired action, you can click a button to apply this to all results. This is a real time saver. 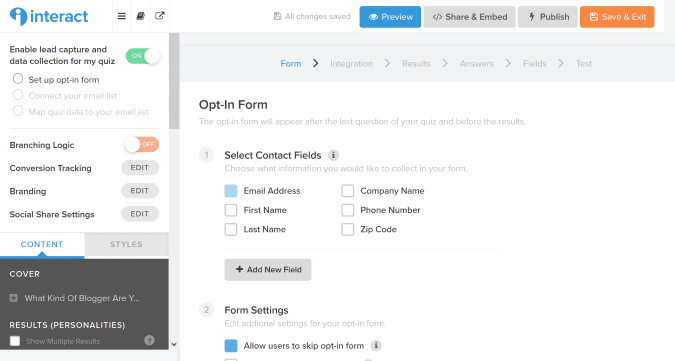 Go into the settings to map your email list fields to quiz fields, (so that name maps to name and email to email, and so on) and set double opt in settings. You can also send a test email to make sure the quiz is working. I did this, just because I’m a bit paranoid about these things. 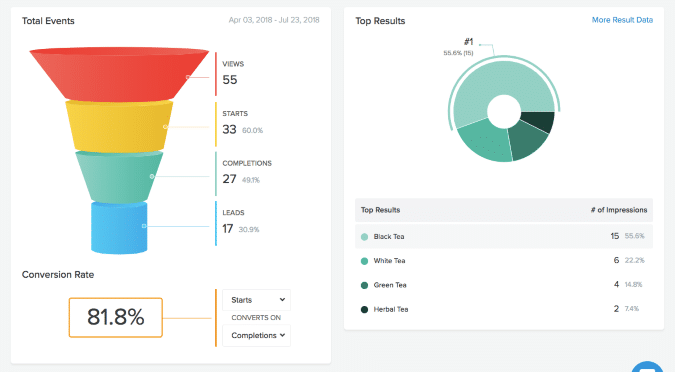 You can also integrate Google Analytics for conversion tracking, and can brand your quiz. But for my first quiz, I decided to keep it simple and went with the default options. The next important step is to publish your quiz. 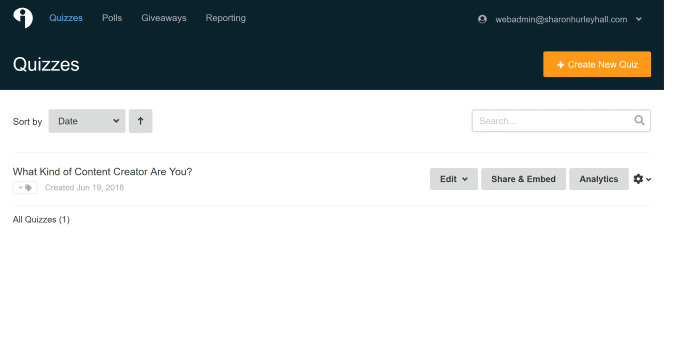 If you’re running a WordPress-based site, install the Interact WordPress plugin. That makes it easy to run your quiz. 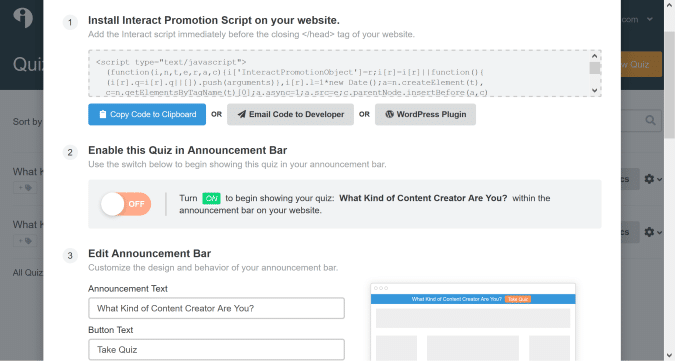 All you have to do is grab the promotion ID and add it in the right plugin field. Then your quiz will appear using the options you’ve set on the Interact site. What are those options? 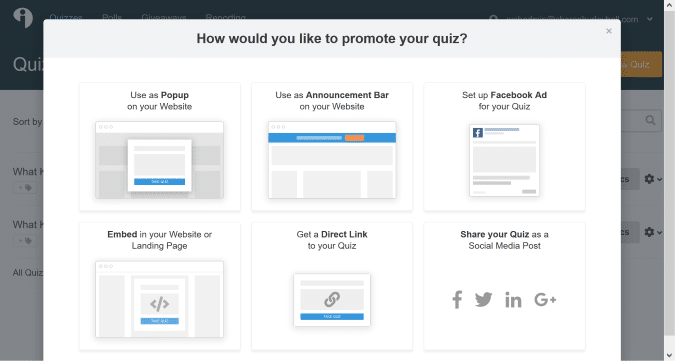 You can display your quiz as an announcement bar or website popup. You can also embed it on your site, share it on social media, or use it as a Facebook ad. For my first quiz, I used the announcement bar, and also grabbed the link to share on social media. Once your quiz has been up for a while, you’ll start to see the results. To find these, login to your Interact dashboard, and go to the Analytics tab. You’ll see how many people have started, completed, and shared your quiz, as well as lead collection data. Here’s how this looks for another quiz. Other tabs allow you to get more details on the results and the questions. This will help you to tweak your quiz for even better results. For this trial, I plugged all respondents into my main email list. But one strategy the Interact team suggests is to segment your email list, and then have different results lead to different segments. This will help you target your email marketing more finely for improved lead generation. Since this took only 30 minutes, I consider that time well spent, no matter how many leads this quiz generates. I plan to explore Interact more to fine tune what happens when people get their results. And I’ll also create a new quiz focused even more on my target audience, and then promote it everywhere. There are also other Interact tools for polls and giveaways that I want to try. Since you can try Interact for free, I suggest you check it out and see how you like it. I’d love to hear if your experience matches mine. 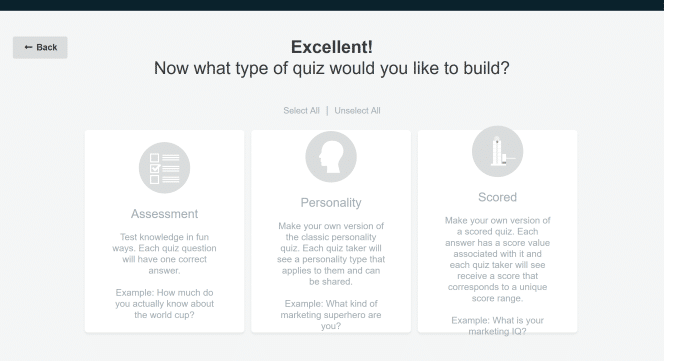 Are you using interactive content and quizzes for lead generation? What results have you had?